DSCC Care Coordinator partnered with Mount Vernon Lion’s Club to make the gift a reality. Fifteen-year-old Allie Riley of Mount Vernon wanted a bicycle of her own so she could go on rides with her family and friends. A traditional bicycle, however, was not a safe option for Allie as she is visually impaired and has problems with her depth perception. Allie’s mother, Melinda, did some research and found some tricycle options for Allie but couldn’t afford the price tag. Melinda went to the family’s Care Coordinator, Donis Vail, from the University of Illinois at Chicago’s Division of Specialized Care for Children (DSCC) for help. Allie has been enrolled with DSCC since she was an infant. 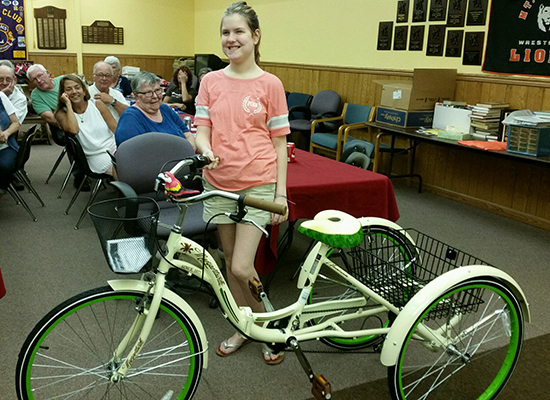 Donis, who works in DSCC’s Olney Regional Office, used her community connections to find funding for the tricycle and pull off a sweet surprise for Allie. Knowing that Allie is a big fan of musician Jimmy Buffett, Donis found a Buffett-themed adult tricycle that’s cream with green tires, a green seat and a parrot-shaped bike horn. She then started researching funding options. When she reached out to the Mount Vernon Lions Club, they offered to pay the entire cost of the tricycle. 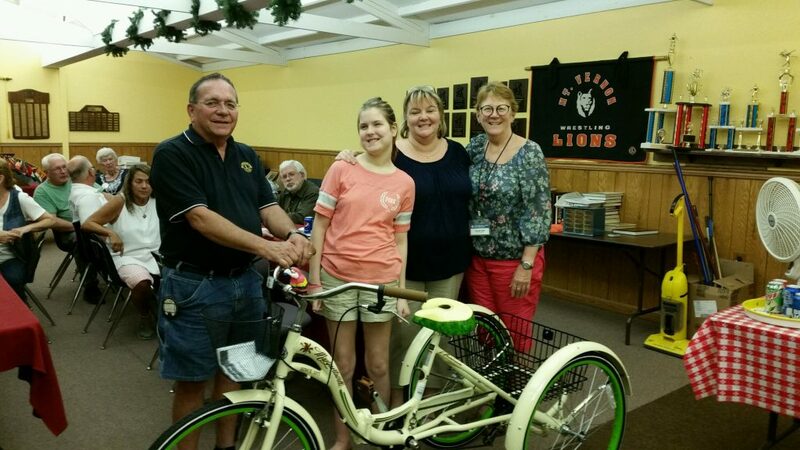 Donis and the Lions Club then invited Allie and Melinda to the club’s meeting last month to surprise her with the tricycle. Melinda told Allie that they were going to a bank meeting so she wouldn’t suspect. Our Care Coordinators are pros at identifying a family’s needs and working with local community organizations to connect the family and youth with the services and resources that can help. The Mount Vernon Lions Club’s generous donation is a wonderful example of these connections and how much they benefit our participants. A huge thank you to all involved, and happy riding, Allie! From left, Mount Vernon Lions Club Vice President Tony Geremia, Allie Riley, Melinda Riley and their Care Coordinator Donis Vail.